Christmas is that time of year when you often get bombarded with gifts you don’t want. Sure, your aunt might have worked for months to knit that wool sweater with dancing snowmen on it, but it sure isn’t going to help you get stronger or leaner. So I’ve compiled a list of Waterbury-approved Christmas gifts for the athlete in your life. Or just take the initiative and buy these gifts for yourself! I have an old disc injury that I’ve managed to contain over the years. Well, that was until last June when I started doing back flips. Yep, my L5 disc reminded me many mornings that it still had some residual damage. I knew I needed be more proactive so I started incorporating more core strengthening exercises and mobility drills. I also make a point to support my low back whenever I was driving or sitting at my desk. So I got one from him and it’s basically fixed my low back pain by freeing up the constant tension I was putting on my discs. I assumed the low back stiffness I experienced every morning was normal until I started using his LumbAir throughout the day. It’s always with me: in my SUV, at my desk, and on the seemingly endless plane rides I take these days. 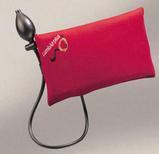 If you have been struggling with back pain, get the LumbAir and use it whenever you’re sitting. You can find the LumbAir at this link. On February 2-5, 2012 I’ll be giving a rare, up close and personal seminar in Phoenix Arizona for the Staley Performance Institute. This retreat will be an incredible opportunity for coaches and athletes to get two full days of personal instruction from me. 6:30pm-8:30pm– Meet and Greet with Chad Waterbury and friends in the evening. This is a great chance to just make friends in a casual environment and, get ready for our seminar. 9:00am-12pm Lecture – Chad Waterbury will cover the science of motor unit recruitment and the essential components of rate of force development – the key to athletic prowess in power sports. 2:00pm-5pm Practical – A complete hands-on session will cover the unique exercise sequence Waterbury uses to develop rate of force development for MMA athletes using three scientific training strategies. Progressions from novice to advanced will be covered. Participants will go through a full-body training session designed to improve balance, power, and strength. 9:00am-12pm Lecture – Participants will learn the shortcomings with the common nutritional strategies, and how to fix them. Meal timing, intermittent fasting, workout nutrition, and supplementation will be covered. 2:00pm-4:00pm Practical – Waterbury will outline the 7 essential body weight exercises an MMA fighter or power athlete should master. Progressions for each exercise will challenge even the strongest athletes. This hands-on session will transform your views on what it means to have full body power and mobility. 4:00pm-5:00pm Q&A with Chad Waterbury – We’ll wrap things up with any lingering questions you have for Chad. Saturday Evening- 6:30-8:30 Closing dinner. Some time to socialize and process what you’ve learned at the world famous Aunt Chiladas. This event will be the most thorough seminar I’ve ever given. My entire system for building power athletes along with my latest tricks for high-performance mobility and nutrition will be covered in detail. I’ve never agreed to do such an in-depth seminar, so this is a very limited opportunity. I hope to see you there! Click here to find out how to attend! I know you want to look cool when you train. But just as importantly, you want to be comfortable. Jaco is a high performance clothing company that has burst onto the hard-core training scene over the last few years. They sponsor many top UFC fighters and they make, in my opinion, the best training apparel on the market. That’s why I was honored when Jaco asked to sponsor me. Their performance t-shirts feel like cashmere but they breathe enough to keep you cool. Their shorts, pants, hoodies, bags and gear not only have killer designs but they can take the necessary abuse from any hard-training athlete. Since I’m a sponsored trainer you might think I’m biased, but I honestly believe you won’t find better training apparel on the market for men or women. Check out Jaco’s awesome line-up at this link. All of the upper body and core training I do these days with MMA fighters and power athletes are on gymnastics rings. It’s the most versatile and effective tool I’ve ever used. The options are endless when it comes to training with rings – you’re only limited by your imagination. If you’ve never attempted pull-ups, dips, handstand push-ups or the front lever on rings you’ll quickly realize why all those male gymnasts have such incredible upper body development. The type of contraction you get while training on rings is like nothing else. The best rings I’ve found for the price are at Christian’s Fitness Factory. 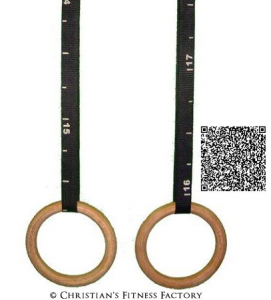 First, the rings are made of wood – that’s essential for absorbing sweat and using chalk. Second, they’re adjustable with markings on each strap so you’ll know each side is even. Third, they’re made from high quality material. You can pick up a pair of rings at this link. Inflammation can be a killer – literally. Name virtually any disease and you can be sure excessive inflammation is a culprit. But beyond disease, it’s that pesky inflammation that keeps you from training more frequently at the highest intensity. The first, and best, line of attack against inflammation is to add plenty of fresh fruits, vegetables and wild fish into your diet. For some, however, that’s not enough. AST makes an excellent line of enzymes that I’ve used with myself and my clients. Just take one pill three times per day between meals for three days. If you’re still suffering from joint or muscle pain, up the dose to two pills three times per day. That should alleviate your suffering by reducing the amount of C-reactive protein levels in your system. The Exclzyme-2AF enzymes represent a super simple way to reduce inflammation and hasten recovery from a muscle strain or sprain. Just click the image below. 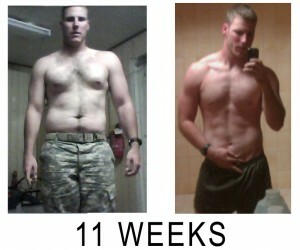 Attached is a before and after photo I took 81 days into your program. The best news of all? Huge in a Hurry is now less than $10! You can get it on Amazon at this link. I have been reading up on your stuff for a few years now. I recently did the total body training in huge in a hurry at the same time changing over to the Waterbury style warrior diet for muscle gain. At 5ft 10in I weighed 168lbs and 9% fat when I started and after 4 weeks I am 169.5lbs and basically 8% body fat. This is pretty good considering the first week I lost weight getting use to this style of eating. I will probably invest in the enzymes ( over 30 lifter). Huge in a hurry is a great informative book and I have read many interesting fitness books. It is not just about getting huge but covers other aspects of training and the nervous system. Keep up the good work of incorporating health and mobility into hard training. Could you explain to me how the huge cholesterol and fat contained in your meal plans in huge in a hurry are safe? CW: There’s virtually no correlation between cholesterol in eggs and higher cholesterol in your blood. Some cholesterol is fine – your body would produce it if you didn’t eat it. And with my fish oil recommendations, all my clients have reduced their cholesterol and improved their heart health. That book is for guys who need to gain a lot of mass. If you’re older or unhealthy, there’s a lot of other info on my site that applies to overall health (Waterbury Diet). Any plans for an article/book/video on the bodyweight exercises for those who can’t go to the retreat? Along the Holiday gifts theme combined with your bodyweight exercises, any recommendations on brands of weighted vests to buy? CW: I like the x-vest because it holds a lot of weight. People like the hyper vest but it only goes up to 10 lbs. Damn, I can barely move!